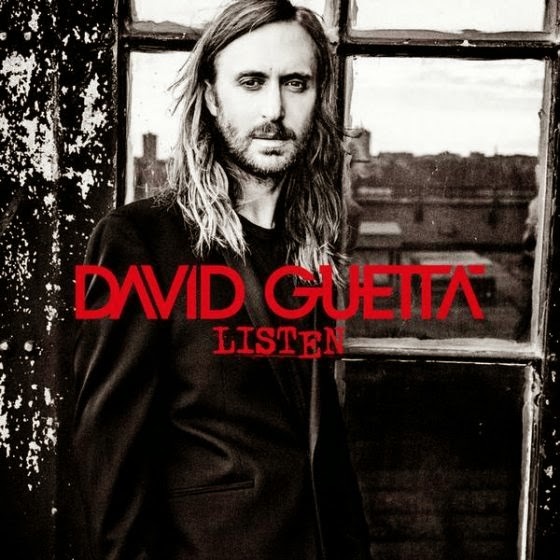 French DJ/Producer/Destroyer of music David Guetta has stated that his latest (sixth) album ‘Listen’ is his most personal to date, constructed from actual acoustic songs rather than just beats. As the title suggests, he’s demanding we actually listen this time – not with our feet, but with our ears. Not that you could tell much of that by listening. Mostly, this is the same old polished EDM that you’ve either come to love or loathe. What I did for Love and Listen both start as piano-led ballads but Guetta soon slaps his trademark donk across them. And some songs even contain, shock horror, A GUITAR. Yet each and every song disintegrates into ravey synths with a beat that’s permanently stuck four to the floor. It’s simply laughable how many songwriters it’s taken per song to come up with this. As you’d expect, there are countless collaborators and featured vocalists: from the obvious (Sia, Ryan Tedder), to the plain dull (Emeli Sandé, The Script), to the bizarre (Ladysmith Black Mambazo). There’s certainly a broad global flavour to ‘Listen’ – Lift me up pairs the aforementioned African group with Norwegian duo Nico & Vinz; No Money no Love brings together hip hop artists from Sweden and the UK (Elliphant and Ms. Dynamite – the former a rising star, the latter resuscitating her dying career); and other songs bring together artists from the US, the UK and across Europe. Only Nicki Minaj is able to break the mould on Hey Mama, with its hard-hitting beat that deviates from the usual pattern and rapped verses. Finally a collaboration that feels equal, even if it’s far from the best work from either artist. The odd track is certainly palatable (this is no Calvin Harris album). At the very least Guetta knows how to write a hook. Previous single Lovers on the Sun has a welcome country vibe (courtesy of Avicii); current single Dangerous has a dangerously funky bassline; the African air of Lift me up adds a lightness of touch to Guetta’s typical euphoria; and both John Legend and Sia provide excellent vocals on Listen and Bang my Head respectively. Dancing is expected, then, but in Sia’s words actually listening to ‘Listen’ may well cause you to bang your head against a wall. Listen: ‘Listen’ is available now.